It’s a little cold this morning –already my 5th day in France being with my wonderful family– in the suburb of SE Paris, so I decide to make another batch of hot chocolate drink for myself and the kids -my niece and nephew– who are sleeping still as it’s early here just past 0700 in the morning. As I travel with my milk frother, chocolate drink can be made just about anywhere to quickly get chocolate into my blood stream. 🙂 Anyway, this “pane al cioccolato” comes to mind as I am sipping the rich, slightly sweet, aromatic and warm chocolate milk wishing a piece of such lovely toast right this minute to dunk into this wonderful drink for a double shot of dark chocolate and yes, more caffeine, not that I need any. I’d followed & enjoyed Jude of Apple Pie, Patis & Pâté for a while until it has become a ghost blog since July 2009. This recipe and method came from his blog where he posted some great photos of the bread and dough. Browse his site when you have a chance, you would have a fun time as I’ve had. 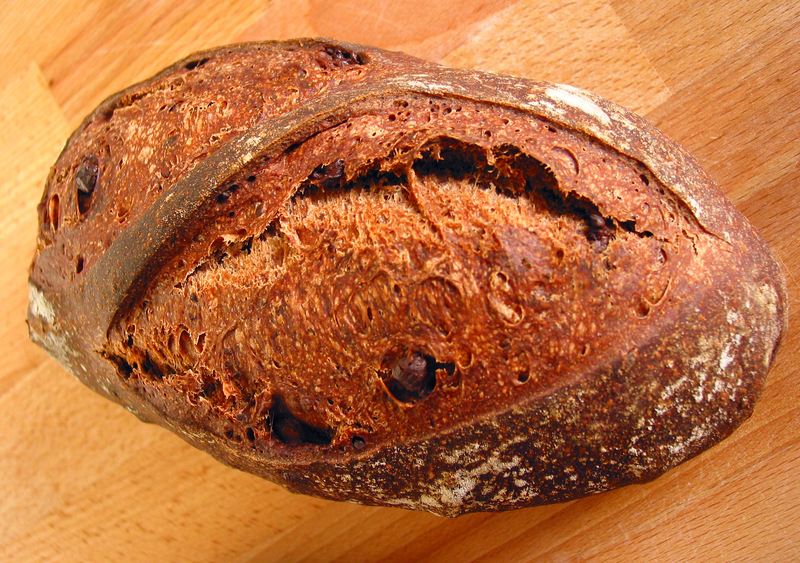 This bread caught my attention because of the one single ingredient namely chocolate, secondly the natural starter used in –as with most Italian bread– its biga, an equivalence of [French/Polish?] poolish, made with a lower-than-100-percent sourdough starter resulting in a doughy biga naturale and thirdly it can be done within a day after mixing the biga the previous night. Mix the biga naturale ingredients until the ingredients are evenly distributed. Place the biga naturale in a bowl and cover. 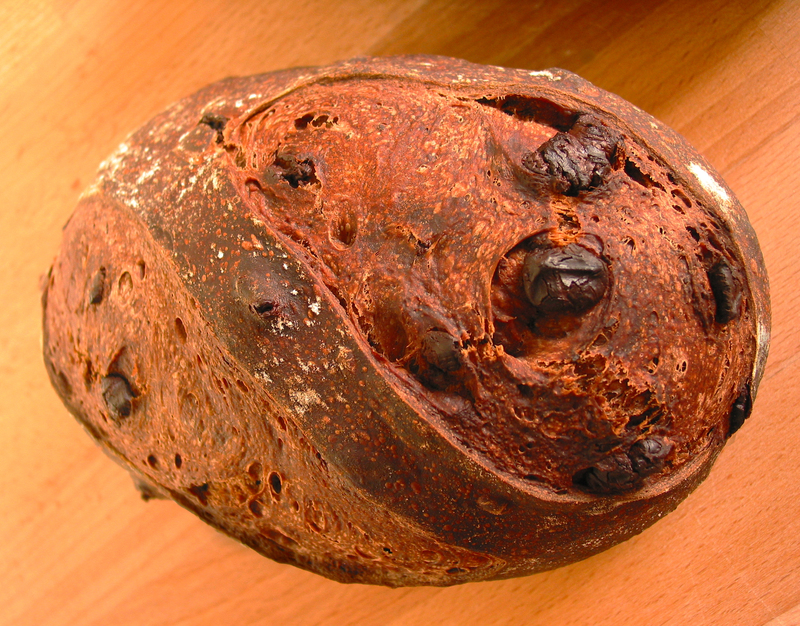 Let it ferment at room temperature (70 – 75° F) for about 8 hours before using in the final dough. Mix all of the ingredients (except the chocolate chips) until evenly incorporated. Knead 8 to 10 minutes by a mixer until it reaches medium-gluten development. Rest 5 minutes. Fold in the chocolate chips by hand or by machine at low-speed for about a minute or until the chocolate chips are thoroughly incorporated. Proof the dough for 2 hours at room temperature in a lightly oiled bowl; if your starter is not as mature to start with it might take longer. Divide the dough into 2 equal portions about 454 grams each. Pre-shape lightly, cover with saran wrap and let rest for 20 minutes. Shape into batard or ball. Let them proof at room temperature for about 3 hours or longer until it’s light and filled with lots of air bubbles. About 45 minutes before the proofing is done, pre-heat the oven with baking stone/tiles to 400 °F (204° F). Prepare steam for the bake. Slash 2 almost-parallel cuts at 15 – 20 degree angle to create flaps over the dough. Load the loaves onto the pre-heated stone, apply steam, close the oven door and bake for 20 minutes. Rotate the loaves, remove steam, and bake for another 15 to 20 minutes. Pane al Cioccolato open "grigne"
It tastes airily light with a soft crust, a chewy crumb and melted dark chocolate in every bite. 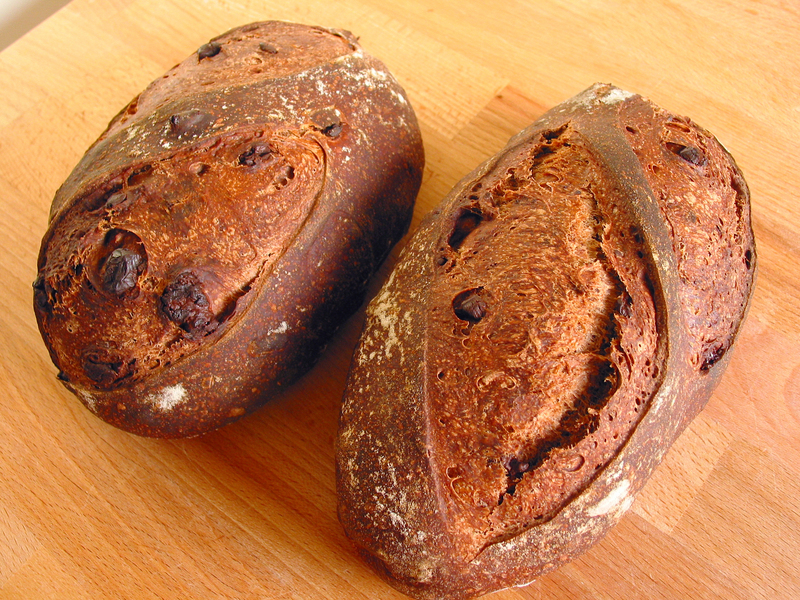 Serve this bread as breakfast and/or dessert with milk or your preferred drink. Enjoy. I couldn’t decide if this is rich-dough or lean-dough bread. It started out as a lean dough with all the basic ingredients and a little bit of honey; however the [dark] chocolate has pushed it away from being lean so it’s rich bread then –Decision reached–. I am pleased to send this bread to Yeast Spotting to share with other bread enthusiasts. Please visit the site to enjoy this week’s wonderful bakes as well as those in the archives. You will have a fun time there, I promise, would most likely go away with a bread or two to bake over the weekend. Ever since I laid my eyes on the beautifully photographed picture of these elegant yet seductive nibbles in Chocolate Holidays by the queen of chocolate Alice Medrich I knew I had to try it. 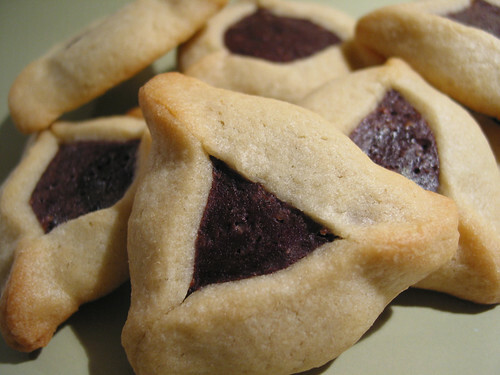 Never heard of hamantaschen before let alone eating or making it so I was very excited planning to offer these at the post-holiday family dinner. Unfortunately I got caught up in so many unexpected things that I did not get to mixing the dough and cook the filling until way into the New Year; even then a slew of appointments threw me off course to leave everything in the fridge for several days. 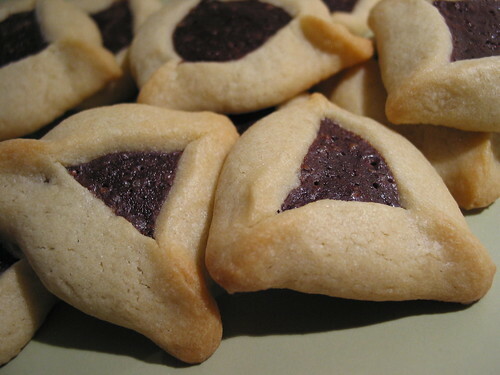 No harm was done though for the dough and the brownie filling are fine and baked perfectly. How do they taste? They are wonderful and just the perfect size. The vanilla is slightly hinted in the wrapper and the filling is a little chewy chocolate-y in every bite. The cookies are easy to make, taste pretty good and freeze well so it’s definitely a keeper. Second I make the cookie dough, sift the flour, baking powder, and salt together and mix thoroughly with a whisk of a fork. Set aside. 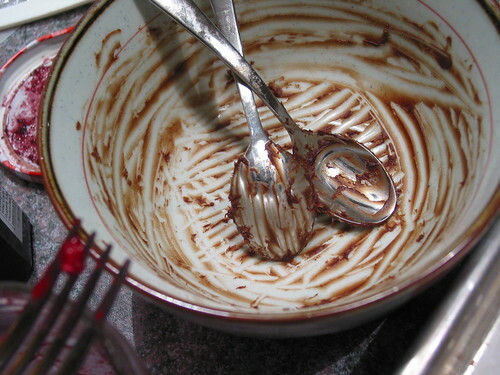 In a large bowl, beat the butter and sugar with an electric mixer until light and fluffy. Beat in the egg and vanilla. Fold in the flour mixture on low-speed just until incorporated. Form the dough into 2 flat disks. Wrap and refrigerate the disks at least until firm enough to roll, preferably several hours or overnight. At this point the dough could be frozen and keep for about a month. Thaw completely before use. Remove one of the disk from the refrigerator and let it sit until supple enough to roll but still quite firm (it only takes about 5-7 minutes in a room- temperature kitchen). It will continue to soften as you work. Roll the dough between 2 pieces of wax paper to a thickness of 1/8 inch. When the dough is thin enough, peel off the top sheet of paper and keep it in front of you. Invert the dough on that sheet. 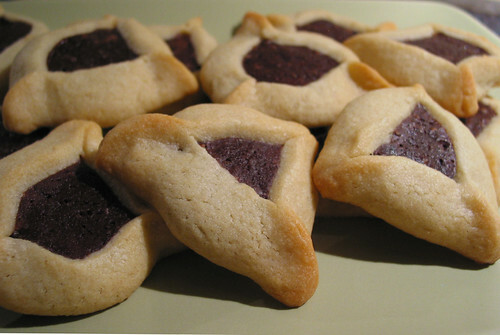 Cut cookies as close together as possible, dipping the edges of the cutter in flour as necessary to prevent sticking. Press dough scraps together and set aside to re-roll with scraps from the second disk. Position racks in the upper and lower thirds of the oven. Preheat the oven to 350 degrees F.
Place cookies 1/2 inch apart on the prepared cookie sheets. Scoop and place 1 level teaspoonful of filling in the center of each cookie. If the cookies are too soft to handle at this point, put the whole sheet in the fridge for 15-20 minutes or longer. I find that it is easier to shape it when the cookie dough is firm. the dough is pretty easy to roll out but gets soften quickly. after I roll and cut the cookie dough, I cool them in the fridge for 20 minutes or longer. the cool (hence firmed up) cookies are a breeze to shape. 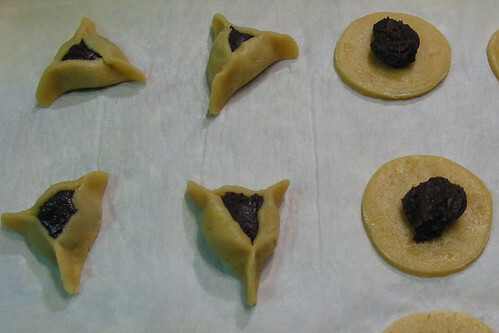 the cookie and filling spread enormously so cooling them before bake seems to help its shape.